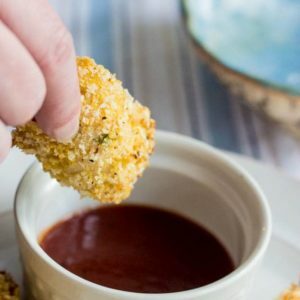 This recipe is 6 SmartPoints per serving, 4 chicken nuggets. In a food processor, add the panko, lemon zest, olive oil, garlic, thyme, pinches of salt and pepper and the butter. Place the mixture on a plate. In a small bowl, whisk together the honey mustard and red wine. Place on another plate. Dip the chicken pieces in the honey mustard-wine mixture and then in the panko mixture. Turn to coat completely. Bake the chicken pieces for 20 minutes, until cooked through.